I dig travel but it comes along with its pros and cons. While it gives me confidence, a sense of power and joy, containment and love; it also gives me a tired body & mind after long travel escapades. In this fast paced life, nothing seems to stop us and with that thought I figured why not share my travel kit with you. The kit which manages to make me less worried, helps me rejuvenate after a tiring travel escapade and makes for the best company. We all have a list of must carry in our travel kit and I have a lengthy one. A good book, music, camera and a scribbling travel note makes my journey a lovely one. Over use of the gadgets makes me carry a power bank and since I don't like sun, a goggle keeps my eyes cool. But what pampers me the best during my trips are these personal care products which I have fallen for deeply. A good perfume never let my mood sour and it is indeed a great "feel good" part of any day. It manages to bring out my personality in right way and keeps in good spirits. I love collecting perfumes and I think they make for a great souvenir as well. In picture: Eclat Mademoiselle Eau de toilette by Oriflame. It is delicate, exotic and classy. With the elements like white hibiscus, fruity expressions and subtle watery notes; it amplifies in to a romantic sophistication. This 50 ml bottle is easy to carry for its size, shape and fragrance of course. A moisturizer to keep skin hydrated and a good sunblock to keep skin unaffected by sun's harshness are two must haves. The sun block shall be applied when you are out in sun whether it is sunny or cloudy because sun is always there even when it's not shiningand thus can be very harmful for your skin. In picture: Neutrogena UltraSheer Dry Touch Sunblock SPF 50+. It is soft, light, smooth and smells calming. I used it for the first time when I visited the hot country Jordan and since then I am its fan. This thin tube fits easily in my kit and helps a great deal. This is one sun block which has suited me well and find its way in, each summer. You can't just always keep applying the moisturizer because when you travel in sun, sand and the pollution, the pollutants stick on your face and make your life worse. You need a hydrant, toner and a re-generator; all in one. In Picture: Love Nature Rose Water by Oriflame. It is cool on face, smells subtle yet heavenly and more than anything it is nourishing water in a small plastic bottle with spray mechanism. With Wild Rose as its main ingredient, this product is a great company during my travels. Just spray it on your face with eyes closed, then wipe with cotton to get rid of all the dirt and get ready to feel awesome. Apply moisturizer later if you like. When you return home after a rough day, your skin often feel sticky, especially when you live in a place like Mumbai; humid and hot. You need a mantra to get rid of all the dirt, and a good face wash comes handy on such days. In Picture: Love Nature Face Wash. This neem based face wash protects combination skin. Massage on to wet face gently and let its anti-bacterial properties do the work. It helps reducing blemishes and balances T-zone. This 50ml bottle is a part of my travel kit to keep skin soft and happy. In the age of mobile and computers; it is difficult to lead a day without them. However with technology, we are bound to get tired when eyes tend to get more affected. The dark bags under eyes are a visible proof caused due to stress and lack of hydration. The skin under eyes is thin and needs more care. In Picture: Optimals Hydra Seeing is Believing Eye Cream. It is a hydrating eye cream which helps lighten the skin under eyes and reduces puffiness and appearance of dark circles. To be used on cleansed skin, I think this recently added product in my travel kit will help me a great deal. I am a no make up girl but I love my lipsticks. It is my armour, lifts my mood and takes away all the attention from my dark circles. My favorite shades have been Oriflame's Red Seduction (The One range) & True Red (Giordani Gold collection) and it is the former which I immediately loved from day one of its use, basically the reason I started wearing lipstick and learnt how to apply one. In Picture: Giordani Gold Iconic Lipstick SPF 15 - True Red. Luxurious satin finish is its USP. Also, it has a creamy and rich colour which only enhances the beauty which is lips. SPF 15 saves lips from harsh sun and fights premature ageing. Shine and colour are perfect. What you saw are my favorite six pampering elements from my travel kit. Apart from that you will always find my Sun glasses, Bose headphones, i-Pod, Canon DSLR camera, Sony portable charger and Nexus 5x phone on every travel with me. So, what's in your travel kit? How do you pamper yourself on the go? Do share in the comments section. That’s nice short and crisp guide...nicely presented the products and the way they are to be used. I always carry a deodorant and nice smelling perfume and of course sunscreen when traveling. Something can't be compromised upon. They are such boon to us travelers. The list is quite useful. 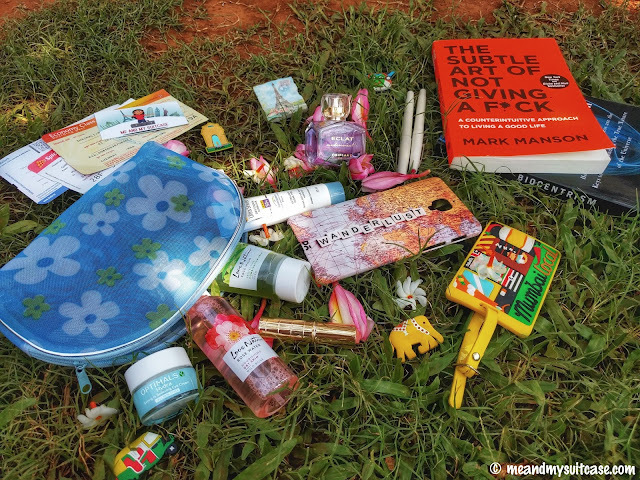 For me, its my deodorant, sunscreen, moisturiser & lip balm, a few medicines and a fevikwik. Sunscreen is kinda winning the list. Thank you mayuri. Thanks fir these great travel tips. A must for every traveller to read. It’s alwsys great to sense check and pointers help. I travel with kids so a lot of sunscreen and first aid for me always. Personally myself it’s fragrances. Thanks for Sharing and I’m off to pack. It is so important to stay hydrated on your travels! I don't use a ton of products you use, but I always carry a water bottle with me to fill up on water and stay hydrated. Especially on long flights since that dehydrates your body so much! Yeah. Flights have that effect. Wow...that is a lot more than what i carry. I definitely need my sunscreen and perfume. I also, carry the basic eyeliners and one shade of lip gloss. Moisturizer sometimes. After seeing your list, I guess I need to add some of these - always good to take care! Good tips! My travel kit definitely has some lipgloss, snacks, wipes, powder and some skin care. I also always carry water with me. I used to have a book on my travels but in recent years I have been traveling with kids (or a baby) so I am not able to read. And of course, I have to carry a lot of things for the kids too. Water, the elixir. I never travel without my water bottle. I feel like I don't care enough of my skin when I travel when I read posts like that :) I normally pack sunscreen, some lotion and make up but I barely wear any only on special diners or nights out! This is such a great and helpful list! I always keep lip color, sunglasses and tissues in my travel kit. Also carry a small bottle of moisturizer with me. I don't carry books but keep a diary and pen to write down important notes in between. That's a nice package to carry around indeed. I used to use Lotus 3 in 1 matte finish sunscreen. Worked out the best for me. Ofcourse, a perfect red lipstick is just enough to pop up a look! Oh man, I totally need to take better care of my skin especially when I travel. I get so excited about exploring that I forget things like sunblock! Thanks for sharing your travel kit - I totally agree about keeping your skin hydrated. And good lip color totally goes a long way! Thank you. Glad my list could be of help. this question quite confusing me when i go for travel and packing my bag. Because lots of thing i want to carry but its quite impossible because we know every little things can be important in trip so i always suggest to go with multiple working kit which can be used for multiple work. Thanks for sharing good travel tips. Sunscreen got added to my travel kit last year during my Ladakh trip. Had no clue about it before that. Haha.. I always used to carry a book too, but I have realised over the last couple of years that I rarely open a book when I'm travelling. The book just travels around with me and comes back. Lol. Such a desirable kit you have there ;) Being a family traveler, one thing that I don't step out during out travels is Band Aid - you never know when and where one of my jumping monkeys might trip!